1. Cut a 1/2" thick slice of tofu from the short end of the block. Cut the slice in half then each half diagonally into triangles. 2. In a small bowl whisk flour, corn starch, salt and baking powder together. In a separate small bowl, whisk the eggs together. 3. Fill a frying pan with cooking oil, about 1/8-1/4" deep. Just enough to cover the bottom of the pan is fine and heat over medium. Here's a fun little trick to see if your oil is hot enough: put a kernel of pop corn in the oil. When it pops, it's ready! 4. Take your tofu triangles and dip them in egg, then the flour mixture, then place into the frying pan. Cook for 3 minutes on each side, flipping gently with your spatula. When cooked, remove tofu from pan and set aside on a paper-towel lines plate. 5. While the tofu is cooking, you can prepare the sauce by whisking together the ingredients in a small saucepan over medium heat. 6. Lightly toast the sesame seeds in a toaster oven. 7. Prepare bowls of hot, cooked rice. Then dredge tofu gently through the sauce and place on top of rice. Sprinkle with sesame seeds, green onions and/or sliced sugar snap peas. 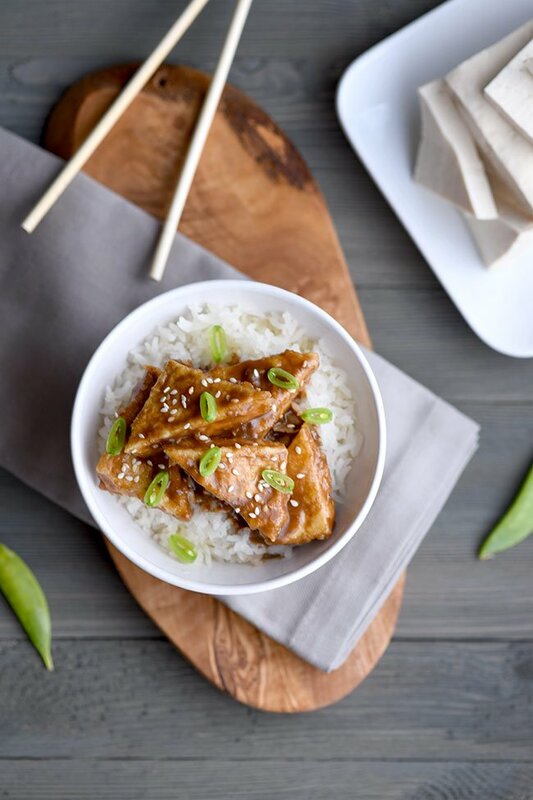 This recipe for crispy sesame tofu, lightly fried, coated in a spicy-sweet ginger-sesame sauce then topped with slivered sugar snap peas, has been a long time coming! And it’s easier than you think to make at home. Ever had restaurant fried tofu? The first time I ever had fried tofu was at a—at the time—pretty edgy restaurant on West St. in Annapolis Maryland, called Tsunami. Have you been there? It’s more of a locals-only spot so you may not have heard of it if you were just passing through Annapolis as a visitor. Now that you know about it though, stop in and check it out the next time you’re in the area! The food is amazing which is probably why it’s been in business so long. Ever tried making fried tofu at home? So, here I am probably 15ish years later, remembering my first experience with fried tofu and now recreating it since I’ve got some culinary skills under my belt. Even if you have little to no cooking experience, if you can follow directions, then you can make this fried tofu. You up for it? The reward will be feeling like you’re eating dinner out at a trendy restaurant. So, stick with me here! How do you make tofu crispy? In a nutshell, you’re going to coat your tofu then fry it to get that crispy outer layer. The fried crispy layer contrasts the silky texture of the inside so nicely, it’s like a little party in your mouth. When you add the delicious sesame sauce, it’ll blow your mind! 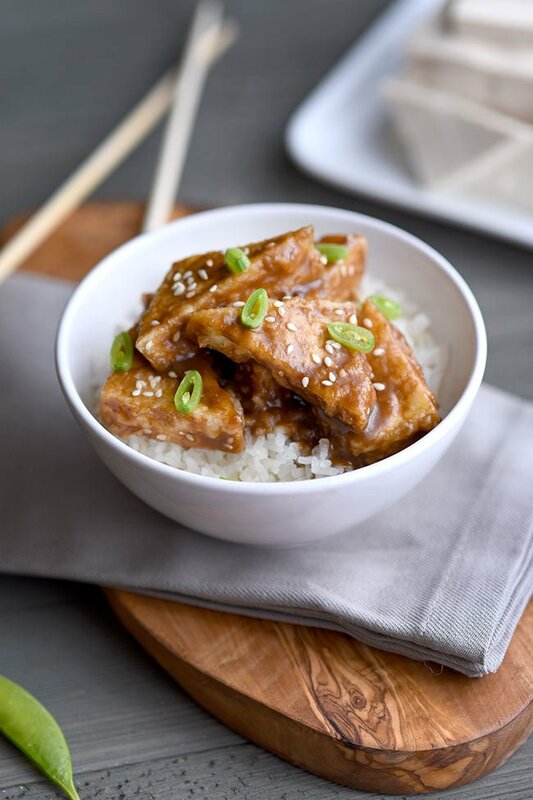 Some tips to make this crispy sesame tofu without fail. The first time. This fried tofu recipe is not difficult but it does involve some prep work. Since there are several ingredients that require separate cooking methods, I recommend preparing your rice in advance (or you can cheat and use microwaveable rice, leftover Chinese food rice, or even quinoa if you want a healthier option). You will also want to lightly toast the sesame seeds ahead of time. This will help everything come together nicely at the end without a lot of stress so you can focus on cooking the tofu, which is easy but may be the hardest part if you’re never done it before. Do you need special tools to fry tofu? You really don’t need anything special to make this crispy sesame tofu other than a frying pan with a lip that can hold a small amount of oil, and a flat spatula. I prefer a thin, flexible metal spatula so you can easily get under the tofu to flip it without hurting it, but as long as you’re gentle you can get away with using a thicker one. I used my cast iron skillet to fry the tofu but any fry pan works. That’s really all you need to know. I think you’re going to have fun making tofu for dinner, especially if this is your first time! If you have kids, try reserving a few pieces of fried tofu without the sesame sauce for them to try. They may like them lightly salted or dipped in ketchup. It may help to tell them its similar to a chicken nugget. It worked with mine anyway! Be sure to also browse my other dinner recipes here and join my new and free, online cooking club here! 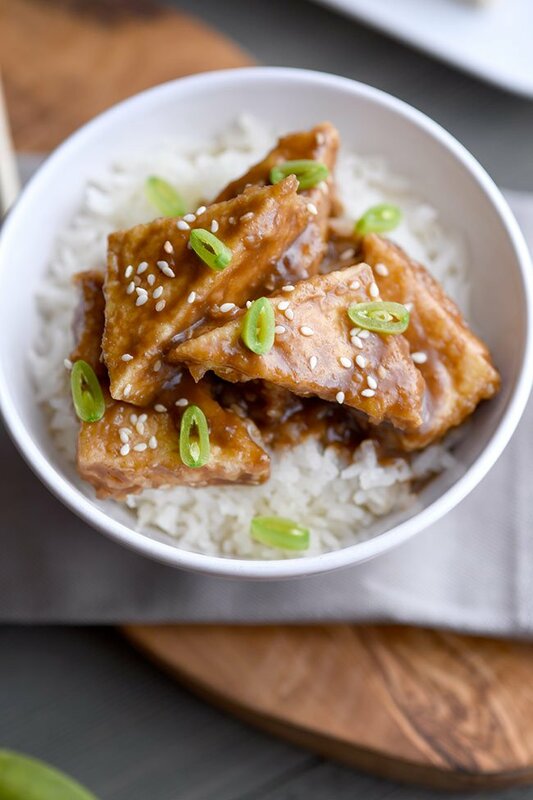 This crispy sesame tofu with rice was featured on Meatless Monday and Wine’d Down Wednesday! I added more veg, but this is so delicious as-is. Thank you! Thanks for the feedback Alana! Glad you liked it!